William Rushton's recent painting "The Jazz Trio," which features David Park--the much-loved progenitor of Bay Area Figuration--on the piano, has a lot to say about the kind of human energy Rushton feels that a painting should have and also about shared creativity. "The musicians in my painting are in their own worlds, but not ashamed to share it," Rushton muses. "They aren't self-conscious because they are part of a community." Of course, Rushton's painting is also a nod to Park, and to the tradition of Bay Area Figuration, a flexible approach to painting which continues to give succeeding generations of artists permission to explore the broad range of painterly possibilities between representation and abstraction. Rushton and his fellow-artists Linda Christensen and Melinda Cootsona are rather like the musicians in "The Jazz Trio": they are part of a community but they are also very much individuals whose works are their personal variations on a shared tradition. Each of these artists is interested in depicting the human figure from a humanistic perspective and all three artists handle paint courageously and energetically: they share a core set of values. Then again, seen as individuals there are some differences in their styles and approaches that are both subtle and striking. Linda Christensen has recently been looking at the works of Vuillard and Matisse--as so many Bay Area artists have over time--and learning from their "Intimist" approach to the human figure. "Intimism gives a view into personal life," Christensen explains, "and in my choice of subject matter I go for the everyday." Combining loose brushwork and palette knife, Christensen tries to get her work to come alive--to "breathe"--by using long brushes and applying stencils to challenge herself as she works. Keeping in mind that painting can be like "jumping off a cliff" Christensen often stands in front of the easel and says to herself, "Here I go!" In her painting "Beach Sunset," a broadly-brushed female figure leans back and shades her eyes as she looks towards an orange-hued sunset. The woman is painted in bold, schematized zones of color, and her pose says more about her than her features as Christensen is more interested in body language than portraiture. Because they aren't specifically identified or individualized it's easy for viewers to "connect" with Christensen's figures, and their situations. "I hope they will notice themselves," Christensen notes. "It's really about humanity, and our connection with ourselves: that emotion." Melinda Cootsona, who has a background in interior design and drafting, is equally interested in the human figure in relation to the spaces that surround them. She begins each composition with rough notations--she calls them "graffiti marks"--and then uses photographic references to insert and locate her figures. Cootsona has been gradually trying to take her work in a more abstract direction, partly due to Linda Christensen's influence on her work. By keeping three or four paintings going all at once she manages to keep her surfaces fresh and lively. As she explains it: "I'm very interested in layering--in pentimento--and I'm constantly putting on paint and then taking it away. " Cootsona's canvas "Holding On" is enlivened by numerous overlays and scraped-away interchanges that reveal traces of the spontaneous process that lead to the finished composition. The title refers to the model's pose that has at least a hint of tension. "I want viewers to have an emotional reaction to the figure," Cootsona explains. "It's about what the figure is doing, but also about what might happen." To give her compositions their sense of narrative possibility, Cootsona relies on pose and setting and avoids rendering facial features: "As soon as you add a face, it's a portrait" she observes. By avoiding portraiture, Cootsona gives her full attention to composition and as a result her canvases feel like complete painted worlds. That sense of completeness supports and enhances the dramatic possibilities that she conjures up. William Rushton is very much a process-oriented painter: "I don't always know where I am going, but I know how to get there" is how he puts it. Rushton doesn't use any preliminary drawing on his canvases: he just "jumps in." Rushton's surfaces are distinctly painterly--sometimes even encrusted--but he manages to keep his colors clean and bright. Clearly at ease dealing with the creamy materiality of oil paint, Rushton likes to lose himself in the painting process, especially since he believes that "The fun part is digging myself out." Tuned into the idea that he can put life into his figures, Rushton is interested in interaction and in depicting what he thinks of as "tipping points" which leave his viewers not sure what has just happened or what might happen next. One thing he wants to avoid--and something that he dislikes is some contemporary paintings--is the demotion of the human figure to decoration. "I don't want the figure to be wallpaper," Rushton philosophizes, "I want to create a sense of life that you can engage with and live with for awhile." 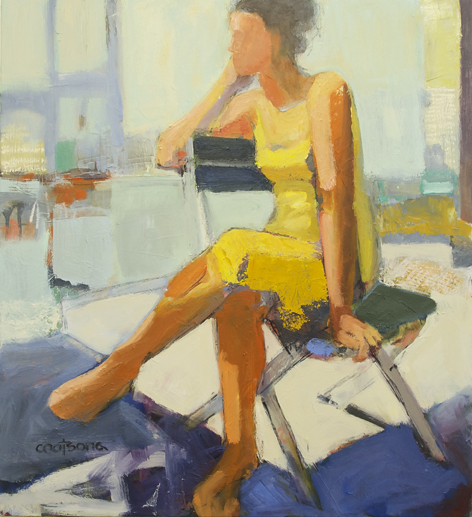 To paint like Christensen, Cootsona or Rushton, you have to be ready to improvise: as Richard Diebenkorn once wrote, you have to "tolerate chaos." 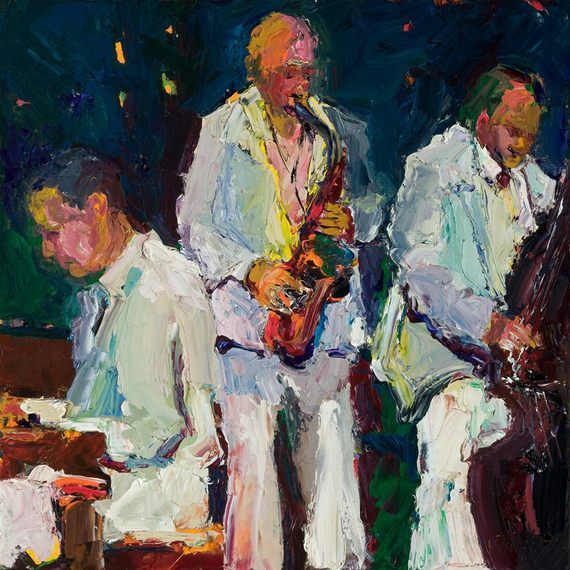 Each of these three artists is very tuned into the act of painting, and each knows how to keep their paintings fresh and alive with possibilities. 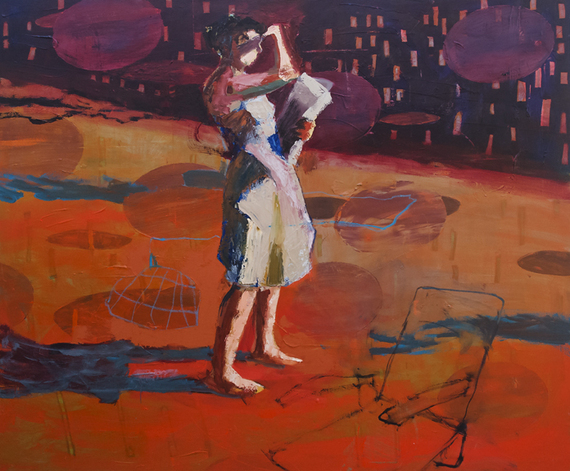 The Bay Area Figurative style, now more than 60 years old, has given these painters a starting point, and a sense of community. And being part of a supportive community, as William Rushton points out, is something that frees up people--and artists--to be themselves. Looking over this group show should feel rather like listening to a band of friends play a concert. Think of each canvas as a jazz solo: a riff on an existing theme that is transformed by nerve and talent into something fresh and new.